Reading and share top 39 famous quotes and sayings about Civil Rights Movement by famous authors and people. 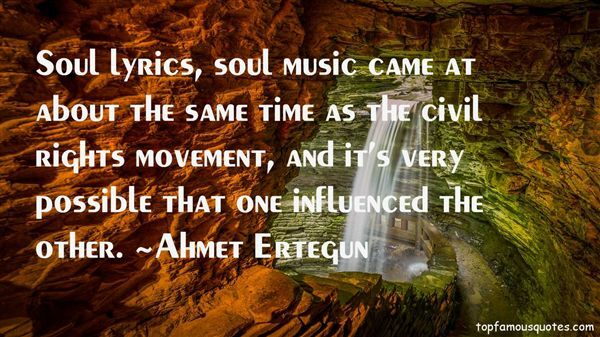 Browse top 39 famous quotes and sayings about Civil Rights Movement by most favorite authors. 1. "Soul lyrics, soul music came at about the same time as the civil rights movement, and it's very possible that one influenced the other." 2. "It was a particularly interesting and exciting time, and the European political and artistic establishment was turned on by the Civil Rights Movement and the artistic revolution that was becoming a part of jazz." 3. "Another tradition to politics, a tradition (of politics) that stretched from the days of the country's founding to the glory of the civil rights movement, a tradition based on the simple idea that we have a stake in one another, and that what binds us together is greater than what drives us apart, and that if enough people believe in the truth of that proposition and act on it, then we might not solve every problem, but we can get something meaningful done." 4. "The greatest movement for social justice our country has ever known is the civil rights movement and it was totally rooted in a love ethic." 5. "I came out of the Civil Rights Movement, and I had a different kind of focus than most people who have just the academic background as their primary training experience." 6. "I think the Civil Rights Movement changed that trajectory for me. The first thing I did was leave school. I was suspended for my participation in Movement demonstrations in my hometown, December, 1961." 7. "In 1962, when I was 19, I visited India. With introductions from people involved in the U.S. civil rights movement, I was able to visit with several of the leading Gandhians there. The hundred-to-one difference in average per capita income between America and India at the time was a stark reality for the people who became my friends there." 8. "Before the Wright brothers flew, flying was fantasy. Before the civil rights movement, people getting along together and the races being equal was a fantasy. Things change because we imagine a different world, a world that is not. And I think that imagination is one of the most important and defining aspects of human existence: our ability to imagine a world that is not." 9. "American capitalism is derided for its superficial banality, yet it has unleashed profound, convulsive social change. Condemned as mindless materialism, it has burst loose a flood tide of spiritual yearning. The civil rights movement and the sexual revolution, environmentalism and feminism, the fitness and health-care boom and the opening of the gay closet, the withering of censorship and the rise of a "creative class" of "knowledge workers" – all are the progeny of widespread prosperity." 10. "I think that the thing that we learned back in the day of the civil rights movement is that you do have to keep on keeping on." 11. "I came at age in the '60s, and initially my hopes and dreams were invested in politics and the movements of the time - the anti-war movement, the civil rights movement. I worked on Bobby Kennedy's campaign for president as a teenager in California and the night he was killed." 12. "The corporate reform movement has co-opted progressive themes and language in the service of radical purposes. Advocating the privatization of public education is deeply reactionary. Disabling or eliminating teachers' unions removes the strongest voice in each state to advocate for public education and to fight crippling budget cuts. In every state, classroom teachers are experts in education; they know what their students need, and their collective voice should be part of any public decision about school improvement. Stripping teachers of their job protections limits academic freedom. Evaluating teachers by the test scores of their students undermines professionalism and encourages teaching to the test. Claiming to be in the forefront of a civil rights movement while ignoring poverty and segregation is reactionary and duplicitous." 13. 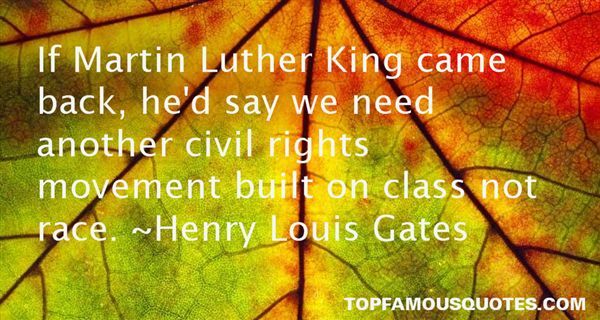 "Obama has little or nothing to do with the civil-rights movement. His roots are in Kenya, and he is shaped far more by anti-colonialism than by anything that Martin Luther King said or did." 14. "In every aspect and among almost every demographic, how American society digested and processed the long, dark chapter between the end of the Civil War and the beginning of the civil rights movement has been delusion." 15. "I had never read a book written by an African-American. I didn't know that black people could write books. I didn't know that blacks had done any great things. I was always conscious of my inferiority and I always remembered my place - until the Civil Rights Movement came to the town where I was born and grew up." 16. "How blind to believe the civil rights movement ever ended. The civil rights movement never ends, and it never will. It has been marching since the beginning of time. Where Martin Luther King started is where Gandhi left off, and where he started, Abe Lincoln left off, and before that Whitfield all the way back to Moses. God has not moved. We have. But it is never too late. We are not at the mercy of these events. We can alter the course of history. We can stand against the dangerous arc of this story. But we need people who are willing to speak truth." 17. "Eyes is the attempt to tell the story of the Civil Rights movement and to create an emotional, intellectual constituency. But what do you do after that? The black community doesn't have institutions that pick up such moments and preserve them." 18. "If Martin Luther King came back, he'd say we need another civil rights movement built on class not race." 19. "One individual can begin a movement that turns the tide of history. Martin Luther King in the civil rights movement, Mohandas Ganhi in India, Nelson Mandela in South Africa are examples of people standing up with courage and non-violence to bring about needed changes." 20. "My parents both were doing the Civil Rights Movement, were very involved with the civil rights to Congress. And my friends' parents were as well." 21. "Look at the Civil Rights Movement. Look at any kind of fight for change. People had to keep fighting and taking their rights. Rights are never given to you. They have to be fought for and they have to be taken." 22. "The social issues outside of football are not as defined as they were earlier, when integration took place and certain rights were legislated. The Civil Rights movement is over. Individuals can buy homes wherever they want, travel first class wherever they want, eat wherever they want." 23. "The civil rights movement would experience many important victories, but Rosa Parks will always be remembered as its catalyst." 24. "Mrs. Parks was a shy, soft spoken woman who was uncomfortable being revered as a symbol of the civil rights movement. She only hoped to inspire young people to achieve great things." 25. "Senator John Stennis:The civil rights movement did more to free the white man that the black man. ... It freed my soul." 26. "My friends in the Congress, I have known Coretta King since I went south during the civil rights movement as a lawyer. She was a vibrant, consistent, totally dedicated partner with her husband." 27. "As a southerner born after the epic events of the civil rights movement, I've always wondered how on earth people of good will could have conceivably lived with Jim Crow - with the daily degradations, the lynchings in plain sight, and, as the movement gathered force, with the fire hoses and the police dogs and the billy clubs." 28. "The arts and a belief in the values of the civil rights movement, in the overwhelming virtue of diversity, these were our religion. My parents worshipped those ideals." 29. "My parents demonstrated against the Vietnam war, they were into the civil rights movement, the feminist movement, they started the first vegetarian restaurant in Pittsburgh." 30. "My parents met when they were graduate students at UC Berkeley in the 1960s. They were both active in the civil-rights movement." 31. "When I was trained as a journalist, as a race-relations reporter in Nashville covering the end of the civil-rights movement, we were strictly forbidden to use the first-person pronoun. There was kind of an electric charge around it. To come out from hiding and use the word 'I' carried a lot of fright for me." 32. "What has been adjudicated and established in the wake of Vietnam and the Civil Rights movement is the ability of the press to basically write or broadcast almost anything about the government. There's very few restrictions in that way." 33. "A new civil rights movement cannot be organized around the relics of the earlier system of control if it is to address meaningfully the racial realities of our time. Any racial justice movement, to be successful, must vigorously challenge the public consensus that underlies the prevailing system of control. Nooses, racial slurs, and overt bigotry are widely condemned by people across the political spectrum; they are understood to be remnants of the past, no longer reflective of the prevailing public consensus about race. Challenging these forms of racism is certainly necessary, as we must always remain vigilant, but it will do little to shake the foundations of the current system of control. The new caste system, unlike its predecessors, is officially colorblind. We must deal with it on its own terms." 34. "The rhetoric of ‘law and order' was first mobilized in the late 1950s as Southern governors and law enforcement officials attempted to generate and mobilize white opposition to the Civil Rights Movement. In the years following Brown v. Board of Education, civil rights activists used direct-action tactics in an effort to force reluctant Southern States to desegregate public facilities. Southern governors and law enforcement officials often characterized these tactics as criminal and argued that the rise of the Civil Rights Movement was indicative of a breakdown of law and order. Support of civil rights legislation was derided by Southern conservatives as merely ‘rewarding lawbreakers.' For more than a decade – from the mid 1950s until the late 1960s – conservatives systematically and strategically linked opposition to civil rights legislation to calls for law and order, arguing that Martin Luther King Jr.'s philosophy of civil disobedience was a leading cause of crime." 35. "That's what he was saying, the civil rights movement - judge me for my character, not how black my skin is, not how yellow my skin is, how short I am, how tall or fat or thin; It's by my character." 36. 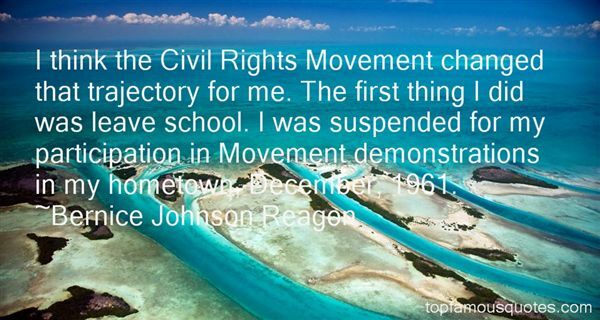 "I took an interest in the Civil Rights Movement. I listened to Martin Luther King. The Vietnam War was raging. When I was 18, I was eligible for the draft, but when I went to be tested, I didn't qualify." 37. "John Brown first swam into my vision in the 1960s when I was a political activist in the civil rights movement and the anti-war movement at Chapel Hill, where I went to university." 38. "Well, it's the last step of the civil rights movement: You know, wrap your hands around some money, right?" 39. "There has been only a civil rights movement, whose tone of voice was adapted to an audience of liberal whites." Isolation and loneliness are central causes of depression and despair."